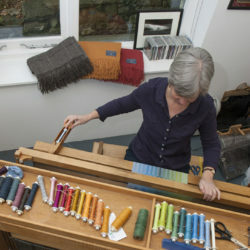 I design and create woven fabrics using predominantly British wools which I source directly from local farms in the Yorkshire Dales and Cumbria. I weave bespoke and commission pieces on my own handlooms as well as working closely with British weaving companies to produce a range of scarves and throws designed by me and woven from my yarn. I sell my yarn to weavers and knitters. I also produce a range of wool walking socks. Any leftover fabrics are turned into cushions, hot water bottle covers and other home accessories.